Barbara Smith is Clinical Nurse Manager of the MICU, University Hospital, Cincinnati, Ohio. She received a BS Ed from Liberty University, Lynchburg, VA, and a BSN from the University of Cincinnati (UC) College of Nursing. 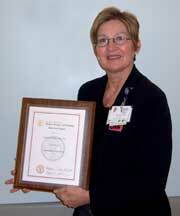 Barbara’s nursing career and contributions to acute care nursing span twentyyears. She worked in management and clinical positions, and in administration and staffing management. She served as Nursing Supervisor, including oversight of ten medical–surgical units and ten critical care units, for University Hospital. Dr. Janice Dyehouse is Professor Emeritus and Director of the RN Educational Mobility Program at the UC College of Nursing. She received a BSN from the College of Mount St. Joseph, an MSN in Psychiatric Nursing and a PhD in Sociology from UC. Dr. Dyehouse has held positions in academia such as Associate Director, Institute of Nursing Research, and Interim Associate Dean for Research at the UC College of Nursing. Her career as a researcher spans forty years. During that time she received several NIH grants as principle investigator and is known globally as an expert scientist in the field of alcohol and substance abuse. She is widely published and has presented at international, national, and regional conferences. Christine is an Associate Professor of Clinical Nursing and Director of Nurse Practitioner and Ambulatory Practitioner programs at the University of Cincinnati (UC) College of Nursing. She received her nursing diploma from Quincy City Hospital School of Nursing, MA, her baccalaureate and masters degree from the UC College of Nursing and her post masters Adult Practitioner Certificate from Northern Kentucky University. She was inducted into the UC Academy of Fellows for Teaching and Learning in 2008, was recipient of the 2004 College of Mount St. Joseph Nurse Educator award, received the UC College of Nursing Excellence in Clinical Teaching Award in 2005 and 1998 and the Dean’s Teaching Award. She has served on university and college committees and in leadership positions in professional nursing organizations. Christine has coauthored numerous publications, presented locally and nationally, and served as a legal consultant. She maintains clinical expertise through work as an Adult Nurse Practitioner at the Lincoln Heights Health Center and volunteering at the Trinity Health Clinic, Lawrenceburg, IN. Christine believes that professional excellence involves a high degree of integrity, knowledge, competence and interpersonal skills. Suzy is a Clinical Nurse Specialist at University Hospital and Nurse Psychotherapist with Northern Kentucky Psychiatry Associates. She received her BSN from the University of St. Tomas, Manila, Philippines and her masters degree in Adult Psychiatry from the UC College of Nursing. 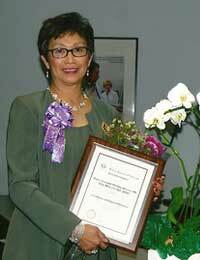 Her nursing career and professional contributions to mental health care span 43 years. She has worked in multiple nursing roles such as Clinical Nurse Supervisor at an alcoholism clinic in New York, Head Nurse at Rollman’s Psychiatric Institute, Cincinnati, Director of Nursing Research and Development at University Hospital, Director/Nursing Administrator and Psychiatric Clinical Specialist at The Christ Hospital, and Clinical Instructor at Northern Kentucky University. Suzy is a consummate presenter on multiple mental health topics. She is a member the ANA, Kentucky Nurses Association, Institute for Reality Therapy, Association of Psychiatric Nurses in America, and has served in leadership positions in the Filipino Association of Southern Ohio. Suzy is founder of the Philippine Nurses Association of Ohio in Cincinnati, where she serves as an advocate and mentor of Philippine nurses, facilitating their acculturation within society and in the nursing profession. Sharon Ashley is the Chief Nursing Officer and Director of Performance Improvement at Adams County Regional Medical Center. For almost 20 years prior to her current position, Sharon served as the Director of Allied Health Services, Outpatient Rehabilitation, Inpatient Case Manager, and Performance Improvement/JCAHO Coordinator at Adams County Hospital. She received her MSN from University of Cincinnati and her BSN from Ohio University. In 1984, Sharon was inducted into the Beta Iota Chapter of Sigma Theta Tau International, The Honor Society of Nursing. Dr. Wanda Wilson became the seventh Executive Director of the American Association of Nurse Anesthetists (AANA) in December, 2009. Prior to assuming this administrative role, Wanda was the Director of the Nurse Anesthesia Major at the UC College of Nursing (CON). Her rich clinical history in nurse anesthesia spans 36 years. Under Wanda’s leadership, the CON Nurse Anesthesia Program ranked 11th out of 108 United States graduate nurse anesthesia programs. 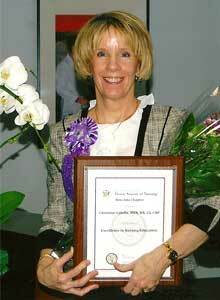 In 1993, Wanda was inducted into the Beta Iota Chapter of Sigma Theta Tau International, The Honor Society of Nursing. Vice President of Patient Care Services and Chief Nursing Officer of the West Chester Medical Center, former Clinical Executive and Chief Nursing Officer for Drake Center, served as Treasurer of the Greater Cincinnati Nurse Executives, and honored as the 2004 Business Courier’s Health Care Hero and the 2002 YWCA Greater Cincinnati Rising Star. Manager of Clinical Education at Mercy Hospital Clermont, former case manager and unit based ICU educator, primary designer of the Mercy Hospital Clermont Critical Care Internship Program, and instrumental in the implementation of the Admin-Rx medication administration system which links the correct medication, dosage, time, and patient. Director of Nursing Research at Christ Hospital, former Professor of Nursing and Director of the Adult Acute Care Graduate Program at University of Cincinnati, Fellow of the American Heart Association, and nationally recognized nurse researcher in cardiac care particularly, quality of life in patients with heart failure and heart transplants. Dean of Online Education at Galen College, former graduate faculty at the University of Oklahoma, 2008 College of Mount St. Joseph Nurse Educator Award recipient, author of the award winning book, Teaching the IOM: Implications of the IOM Reports for Nursing Education, and co-author of Professional Nursing Concepts: Competencies for Quality Leadership. Congratulations to our award recipients who continue to demonstrate excellence in nursing education, clinical practice, leadership and research.